Every season has its representative colors-but to me, fall is the most colorful and most beautiful season. In this article, you will learn how to turn green summer leaves into reddish or yellowish autumn colors. Select [Enhance]-[Adjust Color]-[Hue/Saturation] from the menu bar. The Hue/Saturation dialog box appears. Change the Hue setting to -30. Click OK. The overall image now has a brownish tone. In the options bar, set Feather to 20 pixels. 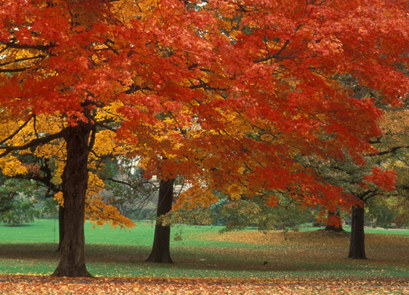 Click and drag over a bunch of leaves of the image to select them. To soften the edges of the selection border, always set a feather value greater than 0 before changing the color. The greater the feather value, the fuzzier the edges. A feather value of 0 will give the selection border an abrupt edge. Click the Add to Selection icon in the options bar. Click and drag the tool over the leaves of the image to add them to the selection. Press [Ctrl] + [U] or select [Enhance]-[Adjust Color]-[Hue/Saturation] from the menu bar. The Hue/Saturation dialog box appears. Click OK. This changes the colors of the leaves to a warm autumn red. In the options bar of the Lasso Tool, click on the New Selection icon. Select the leaves of the image. Click on the Add to Selection icon in the options bar. Click and drag the tool over the other two areas. Press [Ctrl]+[u] or select [Enhance]-[Adjust Color]-[Hue/Saturation] from the menu bar. The Hue/Saturation dialog box appears. Click OK. This turns the selected areas yellow. Open the Hue/Saturation dialog box. Set Hue to -70. Click OK. Press [Ctrl] + [D] to deselect. This turns the selected leaves slightly purplish.